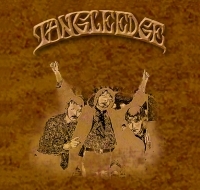 Tangle Edge- Tangle Edge 7"
This is a very limited edition 7” record pressed in only 200 copies by the Norwegian instrumental band, Tangle Edge. It features an electric track recorded on the Norwegian radio in 1985 and an acoustic B side which was recorded live on the radio in Narvik, Norway on October 25th, 1991. Long Time Since/Saw an Egg stats the 7” off with a quite psychedelic beginning before the track finds it’s feet. Fantastic melodic guitar balanced against Hasse’s gentle but heavy bass lines. The synth based like vocals add quite a special feel to the short track at the end. Interesting. Ambrosia Parallels, the B-side features Ronald on acoustic guitar and Hasse on 12 string guitar and this is a beautiful, slightly haunting piece of music. A nice 7” and bound to be quite rare!